“Play builds the kind of free-and-easy, try-it-out, do-it-youself character that our future needs.” –James L. Hymes Jr.
Our week has been full of many lovely, natural learning moments. The week was mostly unstructured, which provided the boys ample opportunities to dig deep into their play and imagination. There was a good mix of inside and outside play. During some slower mornings, the boys loved working with their hands. We made homemade play dough last weekend (which originally started with 3 bright colors, but has made its way to a dull gray by the weeks end due to constant mixing). I was amazed at how long this held their attention this week. Especially Little One…he was sitting for sometimes up to an hour with it. Sometimes they were playing games together and other times they would each be off in their own imaginative worlds with the play dough. It was, at times, magical. In addition to play dough, the boys have also been into kinetic sand lately, which has the properties of wet sand. They “baked” a million cakes with small wooden boxes that allowed them to mold their sand into the shapes of the box. It’s sandcastle building in your living room! What boy doesn’t love to hammer? I got this idea from our local kid’s art studio: golf tees, a Styrofoam cooler top and hammers. The boys made designs, stairs, and got out all of that strong desire to pound things. (Come on, you know boys love it.) Big Brother was so into this activity that he created a tool belt for himself with his belt loop and carried his hammer around for most of the morning. Music played a big role in our natural learning this week (as it often does). We had a super rainy day earlier in the week and though it was a bit of a headache for me, I said yes to the pleas of bringing the drum set up from the basement. Oh, the joy. The boys had non-stop jam sessions, taking turns on the drums and guitar. I see a brothers band in our future. Big Brother’s interest in the piano has also peaked this week. His interest in the piano goes in and out and I have toyed with the idea of signing him up for lessons, but for now I think he’s happy to just explore on his own. We’ve spent some time noticing the repeating patterns in the black keys and I’ve pointed out middle C. This week we enjoyed playing a copy cat game where he or I would play a short collection of notes and the other would copy. He thought that was great fun! Finally, my brother-in-law has left us his record player & records in our care for a while and the boys got to listen to some vinyl. This weeks selections were Van Morrison, The Beatles (obviously), and U2. The playground across the street from our house, otherwise known as our backyard, has been a lot of fun since the sprinklers have been turned on. This week, the drain was not working at its best, resulting in a great deal of puddling. Despite many parents’ efforts to call the city to fix it, the problem has not yet been resolved. The kids, of course, LOVE it. These puddles have drawn lots of attention and focus of the playground play, especially from my boys. Wading, scooping, pouring, and even mowing the puddle has been done. Finally as the water made its way into the wood chip area, the neighborhood friends worked on a rather impressive canal/river set up. This went on until dinner time and a good time was had by all. 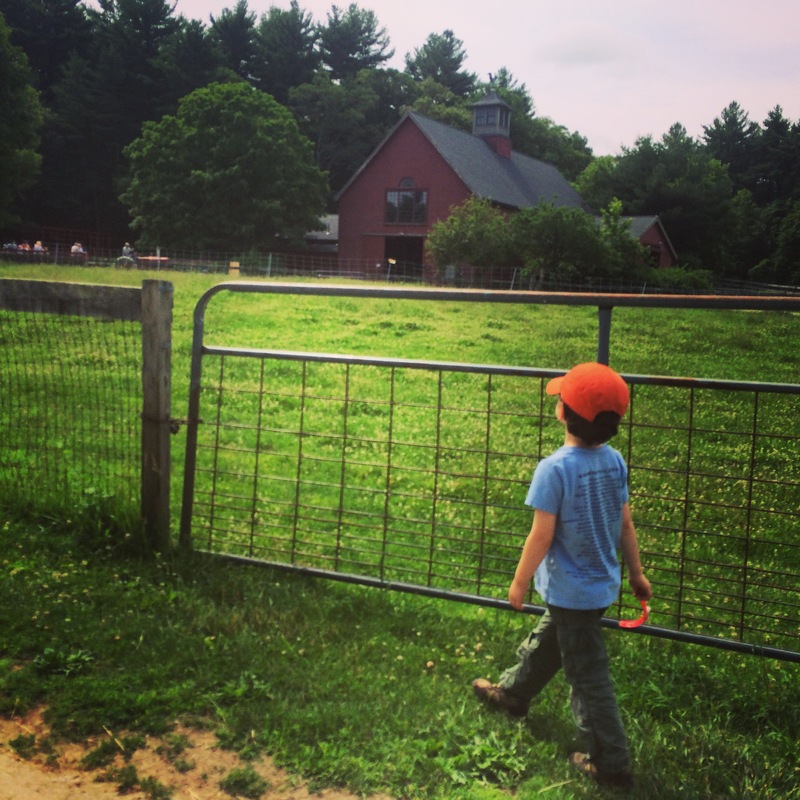 Our final adventure of the week was a trip to the farm. The boys were so excited. When we were checking in, the woman asked the boys what animals they were looking forward to seeing and Little One replied “MOOOO!” Though, Little One’s excitement turned to fear when we were face to face with the animals. Despite the animals being behind the fence, he clung to me for dear life. The only time he relaxed a bit was when we were in the horses’ stable and had the chance to try out some saddles, horse shoes and pretend to brush a wooden horses’s tail. It was a week of natural learning at its finest!